Have you ever seen a company file bankruptcy and you ask yourself “how did that happen?” There are always signs. And it’s rarely from the leadership. Executives are generally skilled at giving some positive spin on the numbers and situation until it’s too late. This is where you will hear “when things get back to normal” or “that won’t work for us”. When fear of change is a driving force, look out. 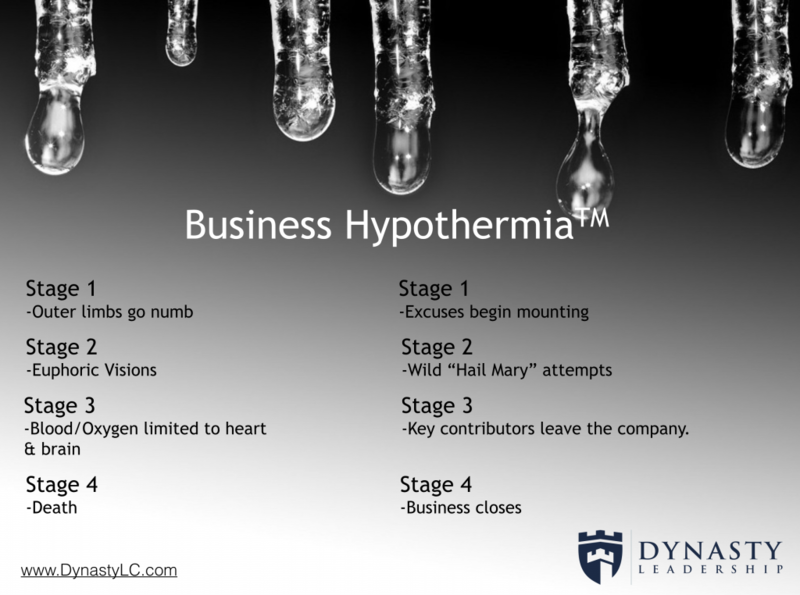 One thing to keep in mind, businesses like people, almost never recover from hypothermia on their own. It’s hard to recognize the signs from inside. You just know it doesn’t feel normal or good. These are “Hail Mary” passes that the management puts into play in hopes of one big turnaround vs. systematic investments and adjustments to the business. Blockbuster (the failed video rental company that didn’t see Netflix or Amazon coming,) in 2003 came up with the brilliant idea of rescinding their late fees. Think about it. You keep the movies as long as you like and we will just keep delivering more. This is where you start seeing cutbacks occur from the things a business needs most (think R&D, sales, marketing, and advertising,) in order to conserve cash. Stage three is where talented people leave the company to preserve their career. The best salespeople and technicians are always getting solicited themselves and are also the most mobile. Avaya (filed for Chapter 11 bankruptcy protection January, 2017.) Executive management was heavily insulated from its customers and its people. That made it very difficult to read the signals that the market was sending and even harder to make timely changes to the business. Younger and more nimble competitors in VoiP and mobile communications swept in and rode off with many of Avaya’s most profitable accounts. 23%-Death is Abrupt = like dropping into icy water. The shock from a sudden change is too much to overcome and there is no one to pull them out. Often through the result of a lawsuit or jury verdict; it can come as a complete surprise. 87%-Death is Slow = like exposure and frostbite. The signs are there, but it is so hard to notice small changes when you see them every day. This is where complacent management and workforces combine with out-of-date processes that eventually let competition in the door of long-standing customers. Talk to people closest to sales and operations. They are exposed earliest. Watch for grand gestures. Programs, campaigns or offers that are totally against company history and culture. Desperate measures for desperate people. Look for recent departures. People that are the most talented will leave early and in groups. If you really want to make a change, get a fresh set of eyes with a unique and actionable perspective. Change is hard and it’s tough to do alone.